Babies often seem frustrated when they are unable to communicate their needs to parents and other caregivers. Parents of these little ones often feel the same sense of frustration unable to understand just what it is that their babies are trying to say. Many parents have found that although their babies may have a limited capacity to communicate verbally, they are able to master simple sign language, allowing the generations to better understand each other. Without even realising it, most babies and parents already employ the use of several simple signs in their daily interaction. Babies may shake their heads back and forth to indicate that they don't want any more food, point to objects that interest them, raise their arms when they'd like to be picked up, and wave goodbye to visitors as they leave. These simple non-verbal communications are the beginnings of baby sign language, allowing babies to express themselves even before they can speak. Even without the aid of universally accepted signs, many parents learn to look to their babies to understand the little one's unique signs. Some babies will fuss and tug their nappies when they are wet or soiled, indicating that they'd like to be clean and dry. Hungry babies may rub their tummies or point to their mouths to show their desire for food. By keeping a close eye on their babies' behaviours, parents may be able to see that their babies are already using their own signs. Unlike adult sign language, baby signs are simple gestures. There are a number of good books and videos available on the market today that can help parents in their quest to teach their babies to sign. Video instruction may be the easiest to understand, but books with clear illustrations work well, too. Parents can begin demonstrating signs to their babies right from the start, using the signs in conjunction with words. Soon, babies will begin to associate the word, its meaning, and the sign, giving them a clear understanding of ways to communicate. It's important that signs be used consistently since babies learn through repetition, so all family members and carers should learn and use the same signs around the baby. Babies who are in an environment where signs are used regularly will be able to use a few by the time that they are seven months old and will likely have an extensive signing "vocabulary" by the time they reach their first birthday. In building up a child's collection of signs, it is important to begin with the ones that will be most useful in everyday life. Hungry, thirsty, more, help, up, down, and hurt are typical first signs, along with the parts of the body. Armed with this short list, babies will be able to tell their parents and carers about their most basic needs, alleviating much of their daily frustration. With sign language, babies who are experiencing pain or discomfort will be able to easily tell their parents by making the sign for "hurt" and pointing to the part of their bodies that is uncomfortable. Once the basics are in place, parents can begin teaching additional signs. Studies show that children who understood and used sign language as babies are often ahead of their peers in speech and language development. 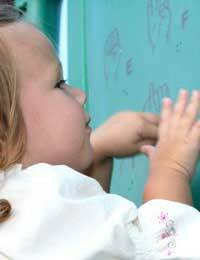 Additionally, these kids tend to drop signing on their own as their verbal communication skills improve, a relief for parents who may be concerned that their children will become reliant on the use of sign language, limiting their desire to develop a good vocabulary of spoken words.